Amber and I were thrilled to participate in the review of In Freedom's Cause Single Package by Heirloom Audio Productions. I am always looking for alternative ways for Amber to learn on her less than perfect health days, and this audio production is a natural fit since we had already scheduled the book In Freedom's Cause by G.A. Henty as part of our history reading for this school year. For this review we were slated to receive the double CD set of In Freedom's Cause, a Printed copy of The Prayer of William Wallace, a digital download version of the In Freedom's Cause Study Guide, and the MP3 download of In Freedom's Cause Soundtrack. However, the vendor went above and also gave us access to everything that comes with the Family Four-Pack! Which also included the In Freedom's Cause ebook with color graphics, an In Freedom's Cause printable color cast poster, a cast of characters roadmap, behind the scenes documentary, and access to the membership website. Whew. 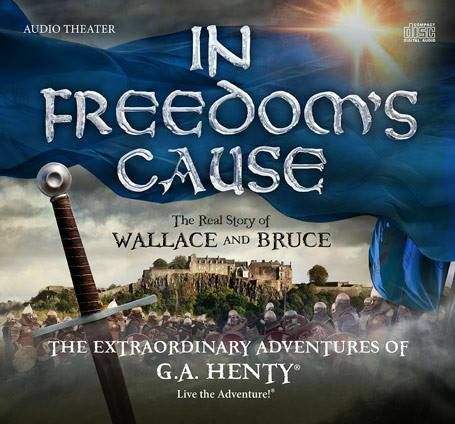 In Freedom's Cause is the real story of Scotland's William Wallace and Robert the Bruce told from the point of a young fighter who was with both men during the Scottish War of Independence. It may be an exciting story written in the 19th century, but it also stays faithful to the actual facts while encouraging the listener to aspire to the honest and courageous traits of the characters. In Freedom's Cause was Amber's first experience with audio theater. When I first presented this production to Amber she thought it would be a regular audio book, meaning a reading of the ebook she already has on her iPad. She was still quite happy to listen rather than read her history that particular day. However, Amber was pleasantly surprised to find the product to be an "Active Listening Audio Adventure". It is not a simple reading of the book, nor is it only a dramatized performance of the book. This is a dramatized performance that includes sound effects just like radio theater! Actually, we had to pause the audio about a minute in because Amber couldn't contain her surprise, "Wait... this has sound effects. It's not just somebody reading the book? I didn't know they made these things." We did choose to convert the CDs to MP3 format for use on an iPad since Amber would be listening a distance from the CD player. She listened to the two hour production in only three sessions because it captivated her so deeply. Amber was able to eat her breakfast, wait for her medication to kick in, and rest her strained eyes all while enjoying her history lesson for the day. I was able to listen from nearby while continuing my regular tasks. We quite enjoyed the change of pace and flexibility of this format. After each listening session we used the provided digital study guide on the iPad to discuss the major topics covered. I loved having the study guide right on my iPad with all my other school resources. The study guide has a Listening Well section for each chapter that includes not only plot questions but also asks the listener to extrapolate the character's feelings and positions. Then the Thinking Further questions helped us understand the implications of the happenings from the current chapter. Most chapters in the study guide also include a list of Defining Words which might be unknown or unclear to the listener, including cultural terms and locations. I wasn't concerned with Amber remembering all the intricate details of the story, but rather understanding the message being presented. Still, she remember a fantastic amount of the specific plot points. We covered a major portion of the Thinking Further questions and some Listening Well questions during our discussions. For some of the Defining Words I asked Amber to write down her understanding of the meaning before looking up the words, while for others we verbally reviewed the meanings. The digital study guide was a perfect companion to the audio production of In Freedom's Cause for our schooling style. Finally, Amber and I read together The Prayer of William Wallace, which is based on Psalm 23. We then discussed how this applied to Wallace, his life, and to our own lives. It was a great way to demonstrate how history and the Bible still apply to us. Working on the Defining Words, plus a sample from the study guide. Besides the learning, Amber made a fun game by trying to identify which of the characters were the actors that she knew. Amber knew Joanne Froggatt (of Downton Abbey Fame) from the last season of Robin Hood and was able to successfully pick her voice as Lady Marjory. James Cosmo (from Braveheart) as Sir Robert Gorden was also an easy answer. However, Amber had just watched The Lion, the Witch and the Wardrobe and so he was fresh in her mind as Father Christmas. Amber was unable to definitively cast Billy Boyd, from Lord of the Rings, as Sir John Comyn but she had it narrowed down to a couple of characters. The surprise came with Skandar Keynes from the Narnia series. Amber was so certain she could pick him out anywhere. In reality, I had to finally just tell her he was Sir Allan Kerr. Overall, we couldn't be happier with the entire package and highly recommend this audio drama. In addition, Heirloom Audio Productions has announced two more releases for 2015, the first of which is With Lee in Virginia due to release around Memorial Day. We are eager to add this new audio drama of G.A. Henry's American Civil War story to our history resources. Be sure to check out more reviews of In Freedom's Cause to see how other members of the Review Crew used this exciting resource.